Thank you for your interest in White Cliffs Country Club for your event. 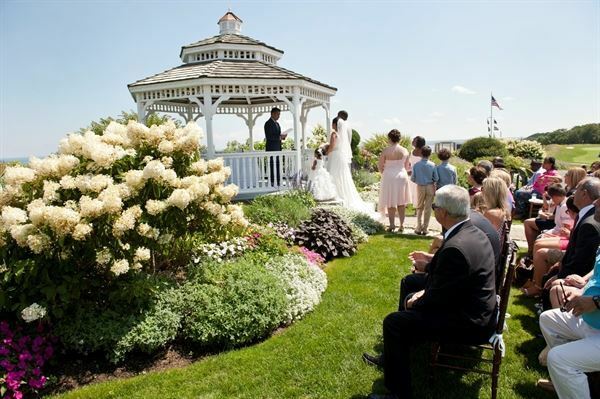 Our unique clubhouse sits atop a 175 foot cliff overlooking Cape Cod Bay offering the most breathtaking views of the ocean and beaches stretching from Plymouth, to The Cape Cod Canal, and all the way to Provincetown. With our Private Beach, Four Season Heated Mineral Pool, Har- Tru Tennis Courts and 18 Hole Signature Gary Player Executive Golf Course, there is something for everyone! Glass enclosed Bay Dining Room with cathedral ceilings can accommodate up to 100 people for hors d'ouevres, dinner, and dancing. The upstairs of the clubhouse, including the Cliff Room with its cherry bar and fireplace, can accommodate up to 200 people, offering views of the cliffs and ocean through our glass walls. Tent on the back lawn with twin 24' high peaks and twinkling white lights. Tent can seat 200 people and can accommodate up to 250 using rented equipment at an additional charge. Special Features: Located atop a 350 foot cliff, overlooking Cape Cod Bay. ?Located in the "Heart of the Commonwealth" the John W. Higgins Armory LLC Event Space is an a perfect location for your personal and corporate needs. We are conveniently located near three major interstate highways and the Boston/ Maine Railroad, this will allow for your guests to arrive with convenience and ease. We offer ample parking located across the street on Randolph Road that faces the side of the building, giving you easy access to the main entrance.